At Folsom Prison is a live album and 27th overall album by Johnny Cash, released on Columbia Records in May 1968. After his 1955 song "Folsom Prison Blues", Cash had been interested in recording a performance at a prison. His idea was put on hold until 1967, when personnel changes at Columbia Records put Bob Johnston in charge of producing Cash's material. Cash had recently controlled his drug abuse problems, and was looking to turn his career around after several years of limited commercial success. Backed with June Carter, Carl Perkins and the Tennessee Three, Cash performed two shows at Folsom State Prison in California on January 13, 1968. The resulting album consisted of fifteen tracks from the first show and two tracks from the second. Despite little initial investment by Columbia, the album was a hit in the United States, reaching number one on the country charts and the top 15 of the national album chart. The lead single from the album, a live version of "Folsom Prison Blues", was a top 40 hit, Cash's first since 1964's "Understand Your Man". 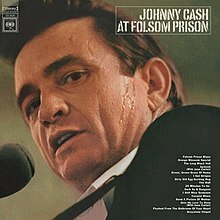 At Folsom Prison received positive reviews and revitalized Cash's career, becoming the first in a series of live albums recorded at prisons that includes "At San Quentin" (1969), "Pa Osteraker" (1973), and "A Concert Behind Prison Walls" (1976). The album was rereleased with additional tracks in 1999, a three-disc set in 2008, and a five LP box set with bonus rehearsals in 2018 for Record Store Day. It was certified three times Platinum on March 27, 2003 by the Recording Industry Association of America for US sales exceeding three million. Johnny Cash became interested in Folsom State Prison, California, while serving in the United States Air Force Security Service. In 1953, his unit watched Crane Wilbur's 1951 film Inside the Walls of Folsom Prison. The film inspired Cash to write a song that reflected his perception of prison life. The result was "Folsom Prison Blues", Cash's second single on Sun Records. The song became popular among inmates, who would write to Cash, requesting him to perform at their prisons. Cash's first prison performance was at Huntsville State Prison in 1957. Satisfied by the favorable reception, he performed at several other prisons in the years leading up to the Folsom performance in 1968. A few years after attaining commercial success from songs such as "I Walk the Line", "Understand Your Man", and "Ring of Fire", Cash's popularity waned. This was due in part to his increasing dependence on drugs. In 1967, Cash sought help for his escalating drug problems; by the end of the year, his drug use decreased and he sought to turn his career around. Concurrently, the country portion of Columbia Records underwent major personnel changes. Frank Jones and Don Law, who had produced several of Cash's albums, were ousted in favor of Bob Johnston, who was known for his erratic behavior and willingness to disagree with studio executives. Cash saw this as an opportunity to pitch his idea of recording a live album at a prison; Johnston enthusiastically supported the concept. Johnston called San Quentin State Prison and Folsom, with Folsom being the first to respond. The album was recorded at Folsom State Prison in Folsom, California. On January 10, 1968, Cash and June Carter checked into the El Rancho Motel in Sacramento, California. They were later accompanied by the Tennessee Three, Carl Perkins, The Statler Brothers, Johnny's father Ray Cash, Reverend Floyd Gressett, pastor of Avenue Community Church in Ventura, California (where Cash often attended services), who counseled inmates at Folsom and helped facilitate the concert, and producer Johnston. The performers rehearsed for two days, an uncommon occurrence for them, sometimes with two or more songs rehearsed concurrently by various combinations of musicians. During the rehearsal sessions on January 12, California governor Ronald Reagan, who was at the hotel for an after-dinner speech, visited the band and offered his encouragement. One focus of the sessions was to learn "Greystone Chapel", a song written by inmate Glen Sherley. Sherley recorded a version of the song, which he passed on to Rev. Gressett via the prison's recreation director. On January 13, the group traveled to Folsom, meeting Los Angeles Times writer Robert Hilburn and Columbia photographer Jim Marshall, who were hired to document the album for the liner notes. Cash decided to hold two performances on January 13, one at 9:40 AM and one at 12:40 PM, in case the first performance was unsatisfactory. After an introduction by MC Hugh Cherry, who encouraged the prisoners to "respond" to Cash's performance, Carl Perkins took the stage and performed his hit song "Blue Suede Shoes". Following this song, the Statler Brothers sang their hit "Flowers on the Wall" and the country standard "This Old House". Cherry returned to the stage and instructed the inmates not to cheer for Cash until he introduced himself; they obliged. Cash opened both shows with a rendition of "Folsom Prison Blues", followed by many songs about prison, including "The Wall", "Green, Green Grass of Home", and the gallows humor song "25 Minutes to Go". Cash also included other songs of despair, such as the Merle Travis song "Dark as a Dungeon". Following "Orange Blossom Special", Cash included a few "slow, ballad-type songs", including "Send a Picture of Mother" and "The Long Black Veil", followed by three novelty songs from his album Everybody Loves A Nut: "Dirty Old Egg-Sucking Dog", "Flushed from the Bathroom of Your Heart", and "Joe Bean". June Carter joined Cash to perform a pair of duets. After a seven-minute version of a song from his Blood, Sweat and Tears album, "The Legend of John Henry's Hammer", Cash took a break and Carter recited a poem. Cash ended both concerts with Sherley's "Greystone Chapel". The second concert was not as fruitful as the first; the musicians were fatigued from the earlier show. Only two songs from the second concert, "Give My Love to Rose" and "I Got Stripes," made it onto the LP release. "I'm Not in Your Town to Stay"
"The Legend of John Henry's Hammer"
"Long Legged Guitar Picking Man"
The album release of At Folsom Prison was prepared in four months. Despite the recent success of "Rosanna's Going Wild", a Cash single released just before the Folsom concerts that reached number two on the country charts, Columbia initially invested little in the album or its single "Folsom Prison Blues". This was due partially to Columbia's efforts to promote pop stars instead of country artists. Nevertheless, the single charted on the Billboard Hot 100 on May 25, 1968; it also hit the country charts a week later. The single suffered a setback, however, when Sirhan Sirhan assassinated Senator Robert F. Kennedy on June 5, 1968. Radio stations ceased playing the single due to the macabre line: "I shot a man in Reno/Just to watch him die". Reeling in the success prior to the assassination, Columbia demanded Johnston remix the single with the line removed. Despite protests from Cash, the single was edited and re-released. The new version became a success, reaching number one on the country charts and the top forty on the national charts. The single prompted the album to climb the album charts, eventually reaching number one on the Top Country Albums chart and number thirteen on the Pop Albums chart—the forerunner to the Billboard 200. By August 1968, Folsom had shipped over 300,000 copies; two months later it was certified gold by the Recording Industry Association of America (RIAA) for shipping over 500,000. At Folsom Prison received rave reviews. Al Aronowitz of Life stated Cash sang the songs like "someone who has grown up believing he is one of the people that these songs are about." For The Village Voice, Ann Fisher wrote that "every cut is special in its own way" and Richard Goldstein noted the album was "filled with the kind of emotionalism you seldom find in rock." Fredrick E. Danker of Sing Out! praised At Folsom Prison as "an album structured an aural experience for us." The success of At Folsom Prison revitalized Cash's career; according to Cash, "that's where things really got started for me again". Sun Records re-dubbed Cash's previous B-side "Get Rhythm" with applause similar to Folsom's, and it became successful enough to enter the Hot 100. Cash returned to the prison scene in 1969 when he recorded At San Quentin at San Quentin State Prison. At San Quentin became Cash's first album to hit number one on the Pop chart and produced the number two hit "A Boy Named Sue". The ensuing popularity from the Folsom concert also prompted ABC to give Cash his own television show. The album was re-released on October 19, 1999 with three extra tracks excluded from the original LP: "Busted", "Joe Bean", and "The Legend of John Henry's Hammer". Stephen Thomas Erlewine of AllMusic praised the new version, calling it "the ideal blend of mythmaking and gritty reality." On May 27, 2003, At Folsom Prison was certified triple platinum by the RIAA for shipping over three million units. Since its release, it has been acknowledged as one of the greatest albums of all time by several sources. In 2003, the album was ranked number 88 on Rolling Stone's list of the 500 greatest albums of all time. Also that year, it was one of 50 recordings chosen by the Library of Congress to be added to the National Recording Registry. Country Music Television named it the third greatest album in country music in 2006. Blender listed the album as the 63rd greatest American album of all time and as one of the "500 CDs You Must Own". In 2006, Time listed it among the 100 greatest albums of all time. The album was also included in the book 1001 Albums You Must Hear Before You Die. 1. "Johnny Cash At Folsom Prison – documentary film (2 hours, 10 minutes)"
3. "Bob Irwin: "Remixing the Folsom Recording""
4. "Marty Stuart: Performance of "Hangman""
5. "Ronda Sherley: "Glen Sherley's My Last Day""
6. "Folsom Inmate Lefty: "Orange Blossom Special Harmonica""
Carl Perkins – electric guitar, vocals on track 2. ^ Pond, Steve (December 10, 1992). "Johnny Cash". Rolling Stone. ^ a b Simmons, Sylvia (January 2003). "Outta My Way". Mojo. ^ a b Johnny Cash (1975). Man In Black. Warner Books. p. 110. Retrieved 15 September 2013. ^ a b Hilburn, Robert (March 1, 1973). "Nothing Can Take The Place of the Human Heart: A Conversation with Johnny Cash". Rolling Stone. ^ Cash, Johnny. At Folsom Prison liner notes. Columbia Records, CS–9639, 1968. ^ Beley, Gene (Winter 2005). "Folsom Prison Blues". Virginia Quarterly Review. pp. 218–227. Retrieved November 8, 2008. ^ "At Folsom Prison - Johnny Cash". AllMusic. ^ Deusner, Stephen M. "Johnny Cash: Johnny Cash at Folsom Prison: Legacy Edition Album Review". pitchfork.com. Retrieved July 22, 2017. ^ "Johnny Cash: At Folsom Prison Legacy Edition". popmatters.com. ^ "At Folsom Prison: Legacy Edition : Johnny Cash : Review : Rolling Stone". archive.org. April 21, 2009. Archived from the original on April 21, 2009. ^ Brackett, Nathan; Hoard, Christian David (2004). The New Rolling Stone Album Guide. Simon and Schuster. p. 145. ISBN 9780743201698. ^ "Hot Country Singles". Billboard. January 27, 1968. ^ "The Hot 100". Billboard. May 25, 1968. ^ "Hot Country Singles". Billboard. June 1, 1968. ^ a b c "At Folsom Prison (1999 Expanded Edition) > Charts & Awards > Billboard Albums". AllMusic. Retrieved November 8, 2008. ^ a b "RIAA — Gold & Platinum Searchable Database". Recording Industry Association of America. Archived from the original on June 26, 2007. Retrieved November 8, 2008. ^ Aronowitz, Alfred G. (August 16, 1968). "Music Behind the Bars: Johnny Cash at Folsom Prison". Life. ^ Fisher, Annie (October 17, 1968). "Riffs". The Village Voice. ^ Goldstein, Richard (June 6, 1968). "Pop Eye". The Village Voice. ^ Danker, Frederick E. (September 1968). "Johnny Cash: A Certain Tragic Sense of Life". Sing Out!. ^ "The Hot 100". Billboard. November 15, 1969. ^ Erlewine, Stephen Thomas. "At Folsom Prison (1999 Expanded Edition) (review)". AllMusic. Retrieved November 8, 2008. ^ "The National Recording Registry 2003". The Library of Congress. October 25, 2006. Archived from the original on November 18, 2008. Retrieved November 8, 2008. ^ "The Greatest: CMT 40 Greatest Albums". CMT 40 Greatest Albums. Nashville, Tennessee. 2006. Viacom. Country Music Television. ^ Aizelwood, John (February 2002). "The 100 Greatest American Albums of All time". Blender. Archived from the original on April 19, 2002. Accessed via webarchive November 8, 2008. ^ "500 CDs You Must Own". Blender. April 2003. Archived from the original on October 13, 2007. Retrieved November 22, 2008. ^ "The All-TIME 100 Albums". Time. November 13, 2006. Archived from the original on October 28, 2008. Retrieved November 8, 2008. ^ Deusner, Stephen M. (October 23, 2008). "Johnny Cash at Folsom Prison: Legacy Edition (review)". Pitchfork Media. Archived from the original on November 3, 2008. Retrieved November 11, 2008. ^ Hoard, Christian (October 16, 2008). "At Folsom Prison: Legacy Edition (review)". Rolling Stone. Archived from the original on November 29, 2008. Retrieved November 17, 2008. ^ "Johnny Cash — At Folsom Prison (Album)". Norwegiancharts.com. Archived from the original on November 11, 2009. Retrieved February 3, 2009. ^ "At Folsom Prison". Chart Stats. Retrieved February 3, 2009. ^ "LP Chart". RPM. 12 (8). October 18, 1969. Retrieved February 3, 2009. ^ "Canadian album certifications – Johnny Cash – At Folsom prison". Music Canada. ^ "Irish album certifications – Johnny Cash – At Folsom prison". Irish Recorded Music Association. ^ "British album certifications – Johnny Cash – At Folsom prison". British Phonographic Industry. Select albums in the Format field. Select Gold in the Certification field. Type At Folsom prison in the "Search BPI Awards" field and then press Enter. ^ "American album certifications – Johnny Cash – At Folsom prison". Recording Industry Association of America. If necessary, click Advanced, then click Format, then select Album, then click SEARCH. Cash, Johnny; Carr, Patrick (1997). Cash: The Autobiography (1st ed.). New York, NY: Harper San Francisco. ISBN 0-06-072753-5. Govoni, Albert (1970). A Boy Named Cash: The Johnny Cash Story (1st ed.). New York, NY: Lancer Books. Streissguth, Michael (2004). Johnny Cash at Folsom Prison: The Making of a Masterpiece (1st ed.). Cambridge, MA: Da Capo Press. ISBN 0-306-81453-6. Cash, Johnny (1976). Man in Black (1st ed.). New York, NY: Warner Books. ISBN 0-446-89086-3. Geary, Daniel. "'The Way I Would Feel About San Quentin': Johnny Cash and the Politics of Country Music," Daedalus, 142 (Fall 2013), 64-72. Levy, Joe (2005). The 500 Greatest Albums of All Times (1st ed.). New York, NY: Wenner Books. ISBN 1-932958-61-4.